Prefer to spend your day tinkering with fish rather than stuck in a mundane office job? Nicolette Craig looks at careers available for those with a passion for all things aquatic. Any job guide can never be fully comprehensive, but could indicate career paths. For nearly all of these it’s a good idea to get experience and most employers welcome volunteers. Experience is usually the most important factor, requiring knowledge of a wide range or filters, pumps and water chemistry. 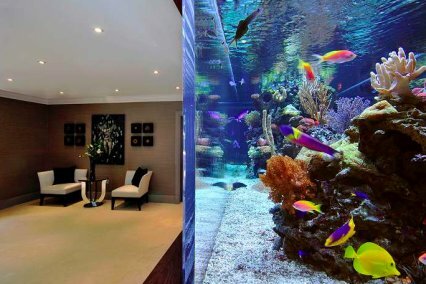 You will need to travel to the homes/locations where the tanks will be installed, and starters at Aquarium Architecture are on £20,000 pa.
Higher qualifications are normally needed here. Jobs tend to be fisheries related, although a few people run their own small businesses offering diagnostics for ornamental fish. Wages will be similar to that of a fish scientist. A minimum of five years of training, then extra qualifications are needed to specialise in fish. A starting salary of around £20,000 rises to £60,000+ once a partner is in practice. Expect long hours! Most work freelance and have either qualifications or relevant experience. Research can be laborious and writers have to be self-starters. Try writing for free or blogging to demonstrate your ability. Wages are typically based on a per word fee — usually 10p — or per article rate, as agreed with whoever is commissioning the article. Even specialists in their fields appear only periodically on television and you will certainly need a fall-back career. Fees will vary, according to air time. Wages vary according to position. Higher qualifications are needed, plus a range of experience, and some positions may require a teaching qualification. Some fish scientists work solely in research. Expect to work hard at getting money from proposals for research projects. Lecturers at a leading specialist college can earn between £20,000-32,000. Senior academic researchers can get £60,000+. Very few people succeed as professionals — most supplementing alternative jobs with photography. Expect to start out entering competitions and working for free or very little. Experienced freelancers, however, can earn around £250 a day, plus processing. Most shops don’t require qualifications, other than standard GCSEs, but will expect employees to show willingness to get their hands dirty. Salaries start at minimum level, with larger chains offering slightly better. With experience and hard work pay may rise to around £15,000. Management positions can earn around £20,000+. Expect to do weekend work too. Vocational courses, such as a BTEC in fish husbandry, will help. Managers may need higher qualifications. Wages are dependent on experience. Farm workers earn between £10,000-£18,000, but the deal may include a vehicle and/or accommodation. A fisheries manager can earn an average of £22,000. Expect long hours, weekends, bank holidays and evenings working in isolated conditions. Most fish for the trade are bred either in the Far East or Europe. UK breeders tend to be small scale, being enthusiasts who work hard to find the correct conditions for their fish. Smaller coldwater ornamental farms exist in the UK, as do a number of aquatic plant producers. Income will depend on the success of the venture! Contact wholesalers and/or importers directly for vacancies. New employees will probably look after fish in the holding facilities and wages should start at £12,000. Some zoos and aquaria specify that employees should have relevant qualifications — even to degree level. Many places, however, will make exceptions for applicants showing a wide scope of experience. A diving qualification may be necessary for larger aquariums. Wages start at a minimum and rise to around £30,000 for management positions. Expect to work some weekends and bank holidays. Most people in fish conservation also have a job in a related field. Academics and senior aquarium staff may get the opportunity to travel and work in-situ. Hours are long, conditions can be poor, so a passion for the subject is essential.Wages will vary according to the project, although grants may come into play. Conservation work, however, is often voluntary! 1. Highlight some clear achievements and good qualifications in your CV. Most jobs will require a relevant qualification, so find out what it is and ensure you have it. 2. Do your research, then ensure your CV is brief but well written and relevant to the job. Check that details are correct, up to date and that there are no spelling mistakes! 3. Get involved in any part of the industry/hobby. At first you’ll just have to volunteer for lots of stuff, but this is how you gain the skills and experience that give you the edge. Demonstrate passion and skill and you will go far, as volunteers are far more likely to get permanent work. 4. Start to network. It pays to develop contacts, build a reputation and gain references. Recommendations from those already in the industry will help smooth the path of any worthy application. 5. Spread your search net wide. Company websites are a great place to start and some employers such as SEA LIFE aquariums only advertise on their websites. Other places to look include Cage and Aviary magazine, Zoo News Digest and the European Association of Zoos and Aquaria (EAZA) website.